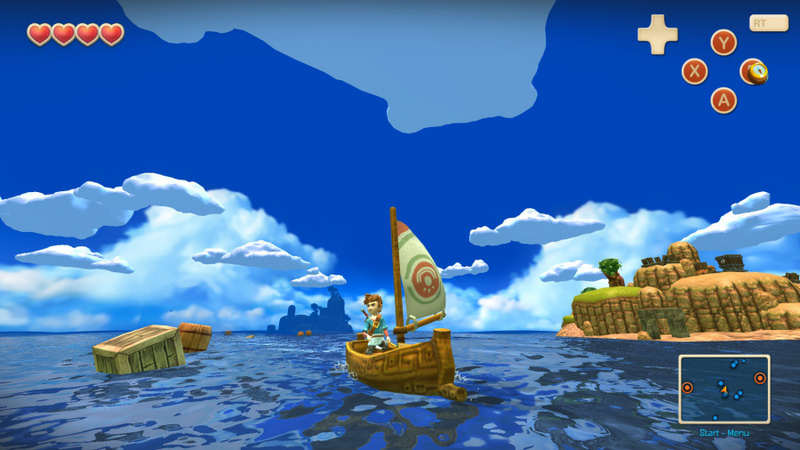 Those may remember when we highlighted Oceanhorn, a title that is inspired by The Legend of Zelda: The Wind Waker. It was initially released on smart devices, before arriving as an enhanced download on PS4 and Xbox One this year. Developer FDG Entertainment has confirmed that all versions of the game have now combined to over one million sales, which is an impressive landmark. Intriguingly, the press release for the announcement states that "the game will be ported to even more platforms soon - including Android, PlayStation Vita and a Nintendo console". It's always good news when more titles are announced for Nintendo's systems; the wording naturally makes us think the studio is targeting Nintendo's as-yet-unrevealed NX platform, though Wii U could be a possibility. The former seems more likely, due to the Wii U's poor current market position, and we'd be surprised if the New 3DS (nevermind original models) was capable of running the game well. We'll find out in good time, and you can check out a Gamescom trailer for the PS4 / Xbox One releases below. Do you like the look of this one, and are you looking forward to playing it on Nintendo hardware? Let us know in the comments. Wow. How can this exists? Event the music steals the theme... and it has been released on devices yet not challenged by Nintendo? It looks really cool too, if I were the developer I would have changed it enough to survive on its own merit, looks as if it would have too. It's a great game. The devs updated it well too with lots of extra content. My iPad version can be played on Apple TV with a full controller too. So for me there's no reason to buy this again, but its worth a shout for everyone else. Yes it IS heavily influenced by Windwaker, but the main gameplay is a little more like classic top down Zelda, albeit with full 3D. @msvt It was revealed for smart devices back in 2013, so evidently breaks no rules. To be fair even the press site says 'inspired by Wind Waker', so they're not pretending otherwise. And herein lies the real problem w/ Nitnod's silence on NX, it's not about just the hardware reveal, it's about people wanting to know what games will be available on the hardware. FFXV? FF7 Remake? Yooka-Laylee? Pikmin 4, or is that already on 3DS? Nintendo is supposed to be a "videogame" company. How many videogames are they promoting this holiday? Pokemon and SMM on 3DS, that's about it. If they are making games, then tell us and show us. That's the real problem w/ the NX secrecy, the lack of info on games. And of course the NX existence is a problem for the lack of games on Wii U. It's practically criminal how few new games are on the Wii U this holiday, and Ntineod continues to sell it for $299. Seriously Ninteod, you sell people a $300 console and you have ZERO games on it for the next 3 months, the entire holiday period, and you expect people to buy more hardware from you next March? Why should they? If you aren't going to show the hardware, at least show the games. When's the last time we saw anything new from Zelda BotW? No games, just more amiibo. It looks really nice. I'd love for it to be on Wii U but unfortunately that ship has sailed. It's like a blend of WW and LTTP..... I'd give it a shot but it is sure weird to see for the first time. Like an actual WW sequel. Is this for Game Boy color ? This looks heavily inspired by Wind Waker. I remember seeing this a while ago, wouldn't mind checking this out. I love WW sailing. @abbyhitter and A link between worlds as well. I'd love to see a Landstalker HD remake in this style. It baffles me that, despite Nintendo's love of Indie Games, NX dev kits aren't widely available to them right now. (Or at least it seems like it judging by developer comments). Wouldn't Nintendo be wanting a strong start with lots of Indie Games and AAA games (which, ironically, it seems AAA devs don't have dev kits either). That being said, I kinda expect this game to be coming to New 3DS via Unity, especially considering the phrasing (Vita and Android + 3DS?). I don't expect Wii U or NX. But please do surprise me. There's no laws saying you can't vaguely copy of the style of other works. That would lead to almost everything breaking the law in some way. @Billsama No can do, there are people who come here just to see how many ways I can mistype it, can't disappoint my fans. Really nice graphics, the ship part did remind me of WW but the graphics looked like a cross between Minecraft and turn based strategy JRPG "Rainbow Moon" on PS3 (for which I've been waiting for it's sequel "Rainbow Skies" for 2 years). Oh, and placing the bombs was a bit too much Zelda. But I don't see it as a rip-off, I think they changed up the graphics and story just enough to make it it's own thing, and I can't recall any Zelda game having those graphics, maybe a 3DS 1 I missed, but the camera angle seems different as well. I'm playing Ni No Kuni now and every time I open a chest it IS the Zelda chest opening music. Some things are just too iconic to ignore I guess. I'll almost certainly get this, but I'll assume from past experience when it releases on NX for $20 it will be free w/ PS+ or $5 on PS4 by then, so I'll get it on there. @abbyhitter I disagree, it looks heavily inspired by Tetris. game looks good, i would buy that in a heart beat!! Obviously inspired by Minecraft, guys. One of those great iphone games. It's a great game, but far inferior to wind waker. I beat this before I played wind waker. I really don't know why it's coming to consoles, but for 10 bucks, it'll scratch the Zelda itch. You know what they say - 'Imitation is the sincerest form of flattery.' It looks very similar indeed, and with his blue tunic, the protagonist looks a bit like Skyward Sword Link too. I don't remember reading about this game when that article was posted around 18 months ago, but it looks pretty well made. Music by Nobuo Uematsu too. I probably won't buy it though - I think Breath of the Wild will be all the Zelda I'll need on the NX. @rjejr Geez, dude. I think you need to take a break from reading about Nintendo for a while. Your comments about NX and Nintendo in general get progressively more angry with each one you post, and your habit of misspelling "Nintendo" has gotten to where you're leaving off entire syllables, so clearly you're more stressed than normal. Maybe take a step back and relax. I don't want you to have an aneurysm or something. I doubt this game would be worth my while. Seems to me like a zelda clone, interesting for those who dont own a nintendo console.Why bother if have the original? While I agree with you, doesnt it make the whole thing even more interesting? I would call it a different type of hype, they show less or rather nothing at all. I mean hype comes with disappointment. You may be shown things that you dont get in the end like this no mans sky game. In regard to nx, we know its supposed to be released in march and should be revealed long before that. We will have ample time to decide if we gonna pick it up or not. I believe the nx will be really worth it. If it was developed in Unity then the Wii U could be a possibility. @-DEMISE- Actually I'm feeling pretty good today, but thanks for your concern. Though seeing your name in my inbox does raise my blood pressure a little bit, I'm pretty sure I've never read a reply from you that wasn't negative, though that may just be your name distorting my viewpoint. But I was right about this one being negative. So it goes. @edhe "and with his blue tunic, the protagonist looks a bit like Skyward Sword Link too." @rjejr I so completely agree with you about the Wii U price tag , I can not believe they still have a 300.00 price tag on the system it really is like they simply don't want to sell it , the Wii U should have gotten a price drop two years ago . For the record I have a bet on the NX reveal it won't be till very late January or First part of February before we get a proper reveal from Nintendo I guarantee it won't be till after Christmas. @rjejr why can you spell every word but Nintendo? @Andrzej777 " to be released in march and should be revealed long before that." I think for most people "long" passed long ago. It's not announcing 6 months in advance that's the problem, it's which 6 months they are. I've long believed that tight-fisted cheap Ninteod, who barely advertises or markets anything, had a NX marketing plan, and with it a marketing budget. That planned budget was for 6 months - announce the hardware in May, ahead of E3, games at E3, and release in October. Along the way have games at Gamescon in Germany, games at the Paris Game Show and at Tokyo game show. Then for whatever reason, the NX launch got delayed from Oct to March. Which you can kind of get if you read between the lines of what Kimishima said earlier this year. So my thinking is, Nintendo delayed the NX launch from Oct to March, and they delayed the 6 month budget and marketing plan along w/ it, reveal the hardware 6 months before launch, then show the games after that. Problem is, no E3, TGS, Paris, Gamescon, nothing like that between Oct 2016 and March 2017 to promtoe the hardware and the games. But I do think that's why it's been so quiet, they budgeted for 6 months, and 6 months is all we'll get. Which would have been great for a October hardware launch, but not so great for a March hardware launch. B/c by waiting until March, and w/ ZERO games for Wii U this holdiay, many peopel will buy a PS4 or X1S this holdiay, leaving no money for Ntineod hardware in March. The earlier they start promoting it, the earlier people may decide to hold off on purchasing another console, but wait too long, and people will already have made up their minds and spent their money. That's why these 6 months aren't long enough, it's the wrong 6 months. You know what, I was thinking of Breath of the Wild. No way 3DS can run this !! Well, it's obviously either Wii U (which I'm sure it was previously announced for) or NX. Perhaps they're being vague for the publicity. Either way, it looks like it might be good! Will keep an eye on it. @peeks It doesn't mean the developer can't gimp the graphics, resolution, and audio to port it to said console, it'd probably be pretty easy if the game was a "New 3DS" exclusive since that's virtually as powerful as a Wii. So why does a Zelda knock-off gets more awards an an ACTUAL Zelda game? Awwww... I got excited for nothing.. I thought it was coming to wiiu. I saw that game some years ago and it looked very nice. @BLPs May I ask why you are developing for Wii U at this point? I'm not trying to be snarky. As the old axiom says, imitation is the most sincere form of flattery. This isn't just an "inspired imitation", I'm quite certain it IS. This game is pretty good. It plays very well on its initial target: mobile tablets and smart phones. It was 100% made out of love for the Zelda games and put in a place where, at the time, they thought Nintendo would never share the space with them. It is original enough and not hiding what its intents are but, I have to admit that It's weird how many elements are almost exactly the same as Zelda when imagining it on a Nintendo platform. That's partly because the trailer is trying to tell you: "this is like Zelda but on platforms you wouldn't expect". As others have said it plays more like a 2D Zelda game and you shouldn't think of it as playing like the 3D entries. Combat for instance is much less satisfying in general and it isn't nearly as involved or complex as a modern Zelda game. It's fun enough at the right price and the right expectations. It was very ambitious in the mobile space when it was first started so I have a lot of respect for this team and I'm looking forward to what they do next. @Williaint Doing a quick google search, I'd say no. Not at all. I mean if you are trying to suggest it's the same geometry or something it's not even close. The style is heavily inspired by Wind Waker on many levels, but it's not stolen. @aaronsullivan Wii U due to the high install base/attach rate, something I cant mention regarding submission fees compared to the competition, dev kit prices, and the middleware we are using, and it's compatability. The Wii U isn't the ideal platform, we admit...that's the wonderful mystery box. Based on what we know, we can safely say it has the necessary interface options to run the title in question (3 face buttons, d-pad, 1 analog stick, 2 shoulder buttons, good and done), and given the almost universal support of our middleware of choice, that's also likely. Our full reason for pledging NX support when crowdfunding this game later this year, will be to drum up hype, and also get a title in early on in the life cycle. Only iffy parts are costs and when dev kits get out. Plot twist: it's for the Virtual Boy. The PC version doesn't run very well on my aging computer, so a "Nintendo console" port would be very much appreciated, yes. @nab1 Virtual Boy ? WOW It's like the copyright infringement is coming right at ME ! I'm a simple man, I see Nobuo Uematsu, I press like. @Andrzej777 Apologies for all of the typos earlier, I was rushing out the door, things to do that couldn't wait. I've fixed it now in case you are curious what it says in English. @rjejr I post plenty of comments that aren't negative. It's just that if I'm replying to another person directly, it's probably because I think that person has said something worthy of scorn, so naturally it follows that my replies to those people would be "negative". But hey, it's pretty funny for you of all people to be chastising someone for gratuitous negativity lol. Like 90% of your comments on this site range from petty complaints to outright whining. @Romeo-75 Nintendo is trying very hard not to sell any more Wii U. They don't want any more angry Wii U owners like me complaining about the complete and total lack of games this holiday, both 1st and 3rd party. They would also rather people save their money for NX in March and buy a NES Mini or 2DS this Christmas. I also don't think they have much stock left to sell, and a price cut announcement might sell it out too quickly, they need it taking up space until NX arrives. Probably only half of that is accurate, but even half of that is enough for the truth, Nintendo doesn't want to sell anymore Wii U. As for the NX reveal, I suggested a few months ago CES in Vegas in January. Not a big game show, but Nintendo is nuts. Sony Dash got unveiled there in 2010, and AMD had a tablet prototype a couple of years ago that looks like the hybrid rumour. So that could be the "big reveal". But, Nintendo needs to tell it's shareholders something in 2 weeks, at least a solid confirmation of the March lsunch, so I think we'll see something over the next 2 weeks. Fingers crossed of course. @kokirii How many words would you like me to mispell? @-DEMISE- I know what most of your comments look like, I've seen enough of them around here over the years, I was just referring to those in my in-box that were negative, not all of yours, which I think you understood. As for all of my comments being negative, that's not true. Most people do view me that way and I understand why. When I comment on something I like it's usually very short - "Looks good." "I'm happy." "Day 1." I really like the look of this game, Yooka-Laylee, I think the NES Mini is genius. Alex'a vids are always great. But nobody remembers those comments, most people probably just read right over them and don't even know it's me. But when I don't like something I always try to explain why, rather than just writing "this sux". Those are the comments people always remember me for. I did take your advice though, took a few hours break, went outside with my son and shot some hoops (that's street slang for play basketball, we didn't actually shoot anything with a gun or anything). Despite the obvious Zelda elements that have been implemented in this game it still looks to be a great game in its own right. Nothing wrong with being heavily inspired by a game as great as a Wind Waker as long as it stands on its own two feet! It looks like Wind Waker, but it doesn't look as fun. From what I've played, games that are this heavily inspired from another developer's game usually aren't anywhere near as good as the original. Vita or Shield Portable...can't really decide. I could also get it on Steam for my GPD Win...hard to decide on a portable. Not going to be wasting money on an NX so I'm ruling that out. 3DS is too weak for this so I'm sure that won't be getting a version. Let's see...oh right I'm out of room on my Vita's memory card, so that's out. My GPD Win might need more room for bigger games so....Android version for Shield Portable it is! joking wise, this looks really great, and being original, it has the style of Wind Waker, as you can see the game screenshot. How are the console versions? I played the iOS version and the main characters movement just felt very "floaty" to me. Also I didn't get a very satisfying feeling when striking something, the collision detection seemed a bit off at times. @rjejr Seriously it is a complete joke that they are still selling the system at that price. I wouldn't pay a dime over 199.00 for it and even that is to high considering it is a dead in the water system. several others downloaded, and several Wii games as well. @Amrulez I think Wii U currently has enough "Selects" for $20 to justify a purchase at $199, plus other games like Wonderful 101 and Starfox Zero going for $25 on Amazon, but I'd still tell people not to buy 1, even at $199, b/c what if NX plays Wii U discs, or if it doesn't, plays Wii U downloads? Games like Super Smash Bros and Mario Kart 8 will almost certainly get ports. So at some point we'll know what NX does, and then maybe Wii U will still be worth it, but we are too close to knowing about NX now. I paid $350 for ours 10 months after launch, and we did get our money's worth, we own about 20 games on disc, but I'm still annoyed adn no new games this holiday. They should have finished Zelda on Wii U in November or early December, leave the NX version for next March. Something for the holidays. Heck, give me a Gamecube port of Super Mario Sunshine, Luigi's Mansion or Starfox Adventures, something. @rjejr Well said in your first comment. Looks interesting enough. I'd buy it if it were a reasonable price on NX. @SLIGEACH_EIRE Thanks. I probably should have stopped there, this is my 28th comment today and they all get progressively worse. Life as a Nintendo home console gamer, it's barely a thing these days. I think I'm going to take the weekend off. Wow......this game is SUCH a shameless rip-off. Umm I'll pass, I didn't fall in love with Windwaker, so I doubt I'll love this. I remember hearing about this game awhile ago. Looks fun, but I'll probably just get it off Steam or something. Or.....maybe just play the real McCoy? More "creativity" from the indie scene. Pfft. @rjer Comment #5 "Why should they?" If the product is appealing and meets a need. That is why. Applies to those who can and those can't wait. Its useless for anyone getting so upset when there is the very real possibility they'll buy the darn thing anyway if they end up liking what they hear and see. And I agree again! The interesting thing is the gamble they are taking. They said they couldnt reveal the nx because they were afraid someone mighy copy what they got in store. And this probably wont be the hybrid thing. So things are rather interesting. @rjejr Agreed - Nintendo really missed a trick by not sticking some Gamecube ports on the Wii U, even as downloads or as collections. Would have loved a Rare Replay-esque collection of games like Sunshine and Eternal Darkness. Even better if they could get Killer7 on there since I only played the apparently inferior PS2 version. This is a really good game, glad to see it's coming to Wii U, which should have happened in the beginning! Yes, there is much love towards the Wind Waker in this title! Great game, and definitely worth the price to anyone that sees it! I have it on PS4 and it is gorgeous and fun to play! @Warioware Very true. Surprised that they never even tried to re-release them as retail games (which would at least showcase more games for the system on store shelves). I thought Luigi's Mansion would, since the sequel came on 3DS, but I guess I was wrong. Hopefully, they add a virtual store for some of the greats, but also, I hope the re-release the hits in HD format for the NX as retail collections. Would love to play Super Mario Sunshine, Paper Mario TYD, Mario Kart Double Dash, the Mario Party's, Eternal Darkness, Pokemon Colosseum, Chibi Robo, Star Fox Adventures and some of the 3rd party titles too (Super Monkey Ball became a new IP for the system, Viewtiful Joe was an exclusive first, Evolution Worlds, Skies Of Arcadia and much much more)...plus, re-release Billy Hatcher And The Giant Egg. I've felt for a long time there should be more in the way of Zelda knockoffs / derivatives. Isn't really much of an alternative for gameplay in that style, but actual Zelda games are infrequent and are fairly spotty in terms of how much they keep to a given style or whatever. And if you're going to knock off one Wind Waker is a good choice, it's one of my absolute favorites. Plus I didn't know this thing was out on PS4 already so if you'll excuse me, I'm going to go get that off PSN. @BLPs So, you are the developer or something? If so, I must say thank you that you are releasing it on Wii U, I will definitely buy it. @Naisho Its not funded yet but whn we get to that stage, we know how much is needed from crowdfunding for wii u. The other platform while unknown is a consideration. OH YES HA HA INSPIRED BY WIND WAKER HA HA JUST LIKE GIANA SISTERS AND MARIO YES CLEARLY INSPIRATION IS A GREAT THING HA HA HEE HEE HO. @rjejr IMO the NX will play Wii U games, but only digitally. It most likely won't have an optical disc mechanism. It makes perfect sense. Now they can offer Wii U compatibility and sell those games on the store but disc owners will be out of luck and have to buy the digital version if they want to still play the game and no longer have a Wii U. Nintendo loves reselling you games that you already own in one fashion or another. IDD with you on the 199.99 price, if I really think about it for someone coming in brand new to the system there is a decent amount of content to be played especially if you sink money into the old system roms. Playing on that gamepad is pretty sweet and that pad is most probably the reason they can't really sell the system for a low price. Most likely it will just end up going out of production once the number of system buys gets to the pathetic levels. Honestly playing it right now gameplay-wise it doesn't actually seem that similar to Wind Waker. Seems more in the vein of Link to the Past, though even then has some stuff not really from that like a stamina meter and leveling up. @gcunit Oh that slipped by me, sorry. Reminds me of Golden Sun as well. Which isn't a bad thing at all. @rjejr no, there is not one person that comes here with any sort of interest in how you misspell Nintendo. Nevermind it being the sole reason. While the visuals are pretty and very charming, the gameplay is a chore. Islands are repetitive, the dungeon design is lazy and far from being as inventive as Zelda, and the controls aren't exactly good. There's a sequel coming though. Oh oh, what could it be?! @3MonthBeef But it will still need to overcome the doubt in people's mind if NX is a home console that reminds people of Wii U. Fool mevonce, shame on you, fool me twice, shame on me. Or, once bitten twice shy, if you like hair metal. PS3 is still getting more games than Wii U. Would people buy a new Nintendo handheld? Certainly, day 1, 3DS is still getting plenty of games 6 years later, but a Nintendo home console? Nintendo will have to work extra hard to convince people. Even if people like it and like the price, they may still take a wait and see attitude. Especially in March, who buys a $300 home video game console in March? In all honesty, I can buy it on PC for like 2 quid on a sale. As Nintendo fans, it's a pretty sad state we're in when we get excited that a developer is ACTUALLY making a game on a Nintendo system. @LetsGoRetro I've had at least 3 people tell me they look for my Nintendo misspellings in the past, I overstated if I said "sole reason for coming here" but honestly, at least 3 different people have told me they were amused by my Nintendo misspellings, there's no reason for me to lie about that. @JLPick @Warioware After waiting very desperately for years for a Super Mario Sunshine HD port - even more so after Captain Toad Treasure Tracker and it's mine cart levels - somebody told me it probably wouldn't happen b/c you need analog triggers to control FLUDD but the Game pad has digital, so it was never going to work properly. So what I really want to know is, will the NX have a controller with analog triggers so we can get a proper SMS HD. And I also think you would need them to properly work the ghost busting vacuum in Luigi's Mansion HD as well. So I don't know if that's the reason why Wii U didn't get any Gamecubebports, but it sounds like a reason which I hope they rectify with NX. Some day. Maybe a touch screen sliding compromise for the analogue sticks? Not ideal but maybe better than nothing. If not then maybe some full remasters like Twilight Princess and restructure the controls. @Inkling Well it doesnt look good. Just coded. Im sure i can show ya somehiw but itd need to stay confidential of course. @Kanbei Yeah, especially when it's not even a major one but just a small indie studio. But that's what happens when you release consoles that can't possibly run the big AAA titles. I like the look of this one and would likely buy it on a Nintendo console. Eh, this game is so-so. It's cool it's coming over but, I'm not buying it. Wind Waker but with Twilight Princess style graphics! The little puzzle islands sort of remind me of Captain Toad as well... although not wholly original, I dig it! Reviews have been really strong as well. If this thing shows up on Wii U, I'll bite for sure. I have it on the PC. The Wii U can't handle this game on high detail and with a large draw distance enabled. So it's coming to the NX it seems. Well if it's inspired by WW, I definitely won't play it. WW was the weakest modern Zelda entry for me because of the annoying sea. @rjejr WOAH! You actually spelled Nintendo correctly once! Where's my Nintoned!? @rjejr you make a very valid point. I really want the nx but if it doesnt get ffxv and vii remake then im buying a ps4 pro. At this point i need some news. I think nintendo will lose sales in march because people will buy ps4 pros at christmas and there is a retail recession in february every year. Does nintendo really expect to defy the post chriwtmas retail depression for some unknown reason - its just nuts! @rjejr yep nobody buys a new console in march. Consider that $300 us in australia is almost $500 australian... not going to sell very well at all. honestly I kind of hope it will be for wii u because we are not getting anything mind blowing or hyped for on the wii u (and also shantae was on Nintendo eshop and being on a physical case so that doesn't count) and it would get us excited for something before the NX releases. (seriously when do we find out what that thing looks lie? I can't see this game being released on anything that is not the Wii U or NX. The 3DS just can't run that. And the Wii U is more than on the way out and I guess if it was coming to the Wii U they wouldn't be making such a big mystery out of it. @Warioware I could also go with a better way to play the DS games on it. The Wii U was kind of sloppy to play 'off-tv-play' for DS games...it was way too small to see anything. I just would like them to add every game from the Wii and E-shop to their next system, and if it is portable (even add the 3DS and DSI E-shops as well)...already added, and then expand from there. I just hope they also do a search engine, where you can actually find every game or see what is listed, without having to remember the titles (like on the 3DS...hard to see what is offered from 3-4 years ago, unless you remember the titles), but also add a cart, to where you can add more than one, see your main total, and then buy more than one game at a time. Hopefully, the shop turns out better, without waiting for the same games that already came out, to re-come out for the NX E-Shop, and instead of having to repay for each game again too. @JLPick I'll take decent backwards compatibility over high level specs actually. I'm hoping that my Wii U downloads will be playable on the go especially since I mostly download nowadays. If they're still supporting the 3DS for a few more years though that might not be supported but it would be great if it is. @Vriess My speculation is that the NX version will be based on the mobile one rather than the one on Steam. NX being ARM based and all that. Looks amazing. They should save that for NX. Heck it's just about 6 months away. The PC version is already out. If the NX will have x86 hardware, optimizing this game should be a breeze and we could see it as a launch (windows) title. Like others have said this game takes large inspiration from wind waker but plays like classic zelda kind of along the lines of a link between worlds in a way. It's a zelda clone in every way possible but does a decent job of it. The sailing sections to get between islands is on rails and every now and then there will be enemies to shoot in the water or crates and bombs to shoot that get you coins but you have no control over the boat which to be honest didn't really bother me. I don't suppose the release of this on 'a Nintendo system' will do much for the sales of this game seeing as most people who want to play this will probably just play it on one of the many other platforms available (i finished it on ps4 last week) but nice for people to have the option I guess. @Warioware I keep on thinking that since Super Mario Maker and Yoshi's Wooly World are coming to 3DS, that the system's games will somehow be backwards compatible...just thinking it, as they're releasing almost next year when the NX is apparently getting released and since nintendo stated a while ago that Mario Maker, Splatoon and a few others were going to be re-released for the NX. Kind of makes a little sense, but still...who knows. @bolt05 $500? Ouch. I wouldn't even be able to justify that FOR the holidays, much less after. I'm hoping for a PS4 deal this holiday for $250. I did buy the Wii U for $350 but it came w/ a $50 Gift Card that I promptly used to buy Pikmin 3 which I really wanted to play. And my kids wanted Pokemon Rumble U, until they played it and finished it in 4 hours, what a waste. Nintendo knows they launched 3DS in the US in March for $249, 5 months later in August it was $169. Let's see what they learned from that. @PlywoodStick My tablet finally figured out Nitnedo in the auto correct spellchecker, my PC hasn't yet though. Maybe Android 4.4 is smarter than Windows 10?